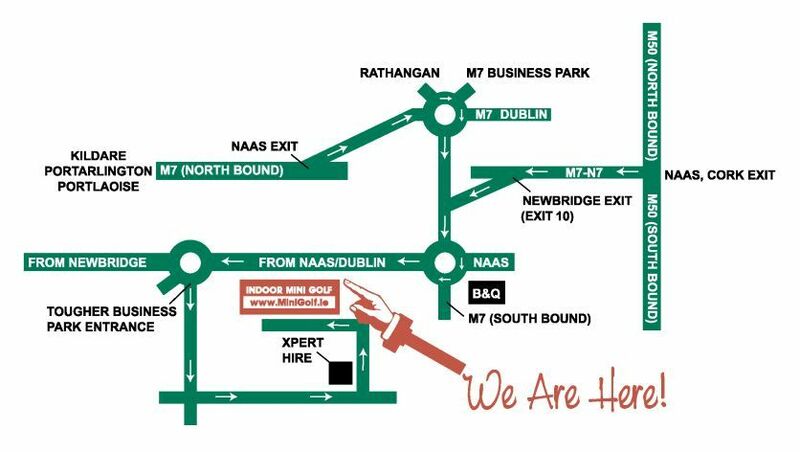 We are based at Indoor Mini Golf in the Tougher Business Park just off the Naas to Newbridge Road. Click here to enlargen the map. - From Dublin take Exit 10 (Off the M7, the exit after the black ball). - At the top of the slip road turn left, take the third exit (sign posted Newbridge). - Follow the road for approximately 2 miles, the Tougher Business Park is the first left at the roundabout. - In the business park take the first left follow the road around, take the first left and we're midway down on the right hand side.